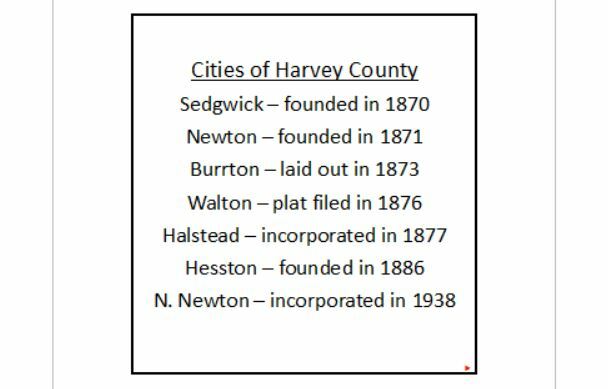 The towns and cities of Harvey County which survived into the 21st century. During the 145+ years since its creation, Harvey County has seen the birth, rise and demise of numerous communities. “Sometimes all that is left is a photograph of a group of children or an obscure mention in a history book, but Harvey County can count at least 17 lost towns since 1871. Some were only on the map for a year or two, boasting a post office and maybe a blacksmith shop. Others, like Annelly, were the site of a school long after the post office and other services had disappeared. Several, like Alta Mill and Zimmerdale, were once thriving, if small, communities. The reasons for their disappearance vary.” – Kristine Schmucker, Curator, HCHM; Jan 23, 2015. The list of vanished communities includes Alta (also called Valentine and Alta Mill) in Alta Twp; Annelly in Richland Twp; Braddock and Doyle in Walton Twp; Darlington (unknown location but likely in Darlington Twp); Eleanor in Highland Twp; Garden City in Garden Twp; Goldschaar in Newton Twp; Hillside Farm and Paxton in Halstead Twp; Fairview (unknown location, possibly in Halstead Twp); McLain (also called McLains) in the corners of Pleasant, Newton, Darlington and Richland Twps; Patterson and Egypt in Lake Twp; Putnam in Sedgwick Twp; Sheldon in Pleasant Twp; and Trousdale (later called Zimmerdale) in Emma Twp.